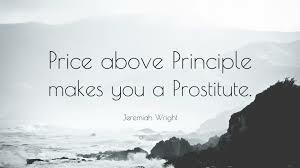 The word prostitute portrays a person whom we would rather not discuss, society says these kinds of people are desperate unethical outcasts caught up in a lifestyle that lacks integrity. but the act of prostitution is simply a deed to earn money when the need to provide the basic necessities is threatened. The archetypical prostitute may be in many of us, how much of yourself have you been selling to satisfy the Ego, the dark and thirsty fear that keeps you trapped in your ancestral patterns? Will you compromise your integrity, your morals, your intellect, your word, your Soul to satisfy your need for physical security? Are you in a job that makes you miserable or sick because you are too afraid to compromise your financial needs? Some will stay in an unhappy marriage because of their fear of being single, middle-aged and alone, or they are not willing to compromise their social status while having to provide for themselves financially. What the prostitute lacks is not integrity but simply faith, without faith fear is apparent. Faith provides us with the belief that everything will turn out ok. Waiting for that lucky break or just the right moment to make a change never seems to come because it is impossible to find happiness if you are not willing to take responsibility for your fears. The entrepreneur to a great degree must marry the prostitute because without the two together success of the business may never come. I myself have felt like a prostitute, sadly so. The sale of my Self has not been completely out of fear or desperation and indeed not because of a lack of faith, what I have to sell is wisdom, the most valuable asset a human can own. My useful, resourceful and life-changing wisdom is a commodity I want to share with the world, not because I am terrified of being able to provide for myself financially or because I lack security in this world but simply because I am a Humanitarian and I hold my faith in you. Faith is about confidence and trust, knowing there is a power greater than you hard at work always looking out for the best interest of your Soul. There is no need for the work of the prostitute in any of us if we are true to our self and we have faith in what we represent in the world. There is no need to ever compromise yourself for anything or anyone when you have faith in your Higher Power.